Headed out to Huntington Beach, CA Thursday morning for the 9th running of the Surf City Classic at OCRC. I’ve only been to this race two other times, so I was looking forward to attending. I would land around 11AM, grab some lunch, then head to the track for practice. They had practice Wednesday, Thursday, and Friday, so I would get plenty of track time. At first the track layout seemed weird to me, it was all doubles and rollers, but shortly after driving it, I really enjoyed it. The track wasn’t too difficult, but it had a few really technical sections that would separate the drivers and keep you sharp if you wanted clean runs. I would only run 2WD and 4WD this weekend, not wanting to be too busy and trying to focus on just those premier classes to get some good finishes. I was pretty bummed after the ROAR nats, so I was wanting to regroup, focus on just two cars, and get some better results. Practice was great on Thursday, I did a lot of testing on my RB6.6 and was really getting comfortable with it. Friday I would get some more testing in with both my Kyosho ZX6 and RB6.6 and felt like my speed was right there to battle for the wins. Traffic was CRAZY in practice….it’s very strange how out west, stock classes are SUPER popular. Here in the midwest, most drivers want to drive mod and have fast cars, but stock is more popular out there, which makes practice very interesting. Saturday would have Q1, Q2 and Q3. I was excited to get things going and get on the clock. First up was 2WD. There was no seeding practice, so the heats were just set at random and there would be a re-seed after Q2. My car was feeling good and I was driving well also. 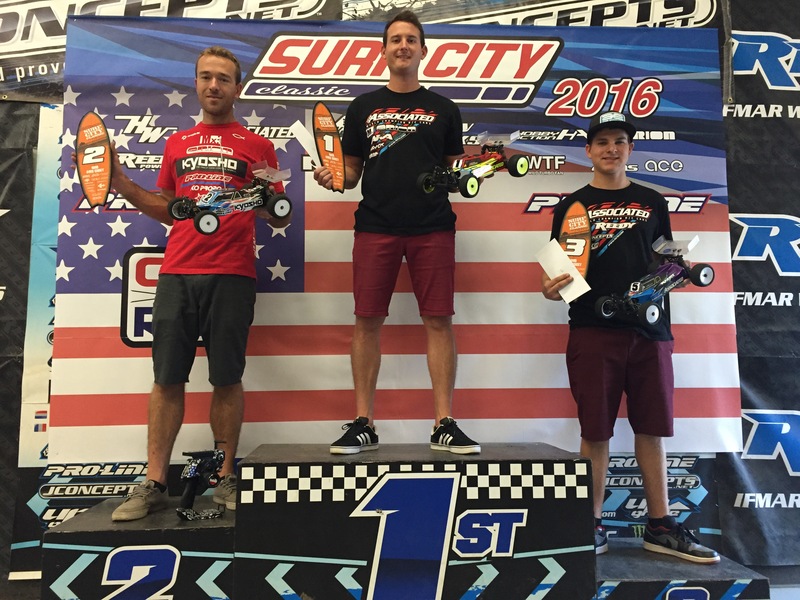 I was leading the heat and ahead of Cavalieri’s TQ in the heat before me, so I was going fast and having a good run. With a minute or so to go, I went into the chicane/double section too fast, over loaded the car, so when I hit the throttle to clear the double, I lost traction and jumped sideways, also shorting it. 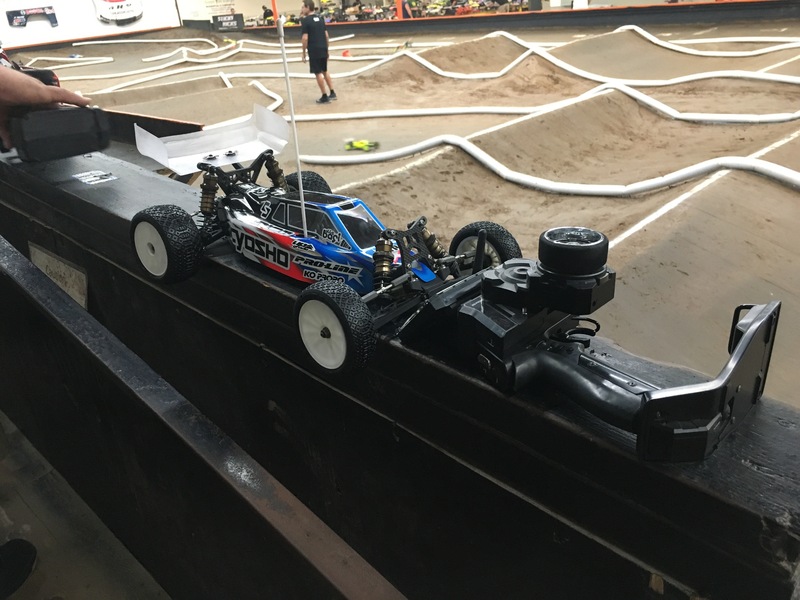 It should have been a quick mistake, but I got stuck on the pipe, then ended up in the infield, and then tried to get back on the track myself, and I finally crashed, needing marshal help. I lost 8 seconds and my run was DONE. I got 13th. 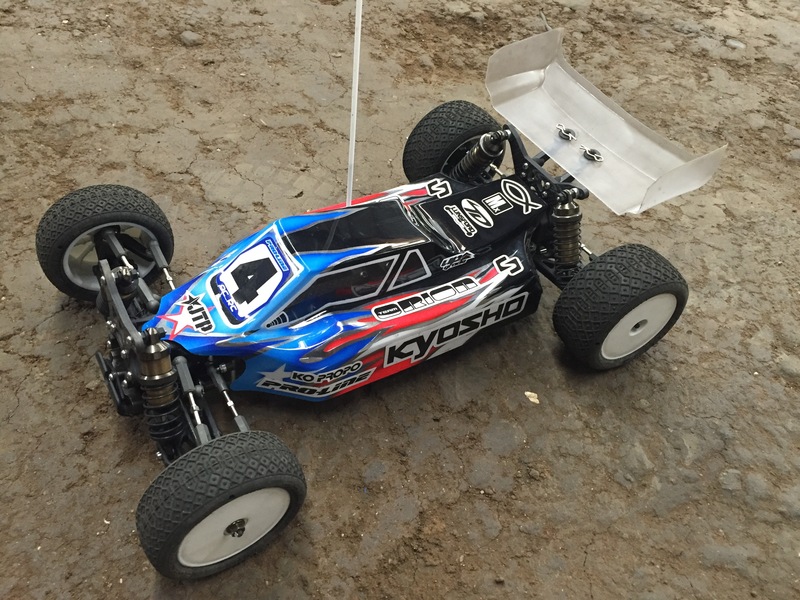 4WD was up next and I was really happy with my Kyosho ZX6, it was driving good and had raw speed, which is a double plus. I went out and just did my thing, smooth laps, got into a groove, and drove mistake free to take the Q1 TQ! Q2 was here and I was ready to get rocking and have a great 2WD run. I made a few minor changes and my car felt pretty good, not great, but not terrible. I was still confident I could go out there and get a top 3 run pretty easily. Right off the start, first turn, I flipped it and needed a marshal. Not the start I wanted, but I didn’t panic, just got back into my race. A few laps went by, I was clicking off fast laps and dropping down my pace, so my run was still going to be good. Just before halfway, I wheelied in the downhill whoop section and went flipping, which popped off my ball-cup….DNF. It was starting to feel a little bit too similar to the ROAR Nats, and I wasn’t enjoying it. 4WD was up, no changes were made at all to my car, I just wanted to keep driving it. I had a decent run, but made some little mistakes, ended up 3rd. They took a short break between rounds and did a heat re-sort. I would be in the B heat for 2WD. I put my car back to how I ran it in Q1, but added a stiffer rear spring. The grip was starting to really come up now and I needed to make a small change. My car was ok, but it was very hard to drive. My front tires also were pretty low on the tread, so I wasn’t sure what the issue was. I crashed again early and just struggled the whole race, ending with 11th for the round. I again needed a top 5 run in Q4 to make the main. 4WD I made the same setup change, stiffer rear spring. It FOR SURE was not the correct change as my car was very difficult and fought me the entire qualifier. I made many mistakes and finished 14th. For Sunday I made some pretty big setup changes on both my RB6.6 and ZX6. The track was getting better grip with each run also, and I felt like the track was really going to suit me good. Q4 of 2WD I was all over the place with which tires to run. The guys that were going really fast were running very low tread tires, even bald in the center. I picked a set that was somewhere in the middle. Right off I knew my grip wasn’t great, but it was good enough. My car finally felt “right” setup wise, so I knew I could drive the car to get a top 3 and make the main no problem. I started a little easy in the qualifier, but then picked it up, as I was getting in the flow. There was some carnage around me, but I was getting around it all pretty clean. I was leading the heat and looking to have a great run, then my bad racing luck continued. With a few laps to go, a car went flipping in front of me, starting the crash on the inside, I swerved to the outside to miss the car. The car had a few more flips than I thought and its front end clipped my wing, spinning me out. I had to turn around and roll the next jump, losing 2 seconds. That would drop me from 4th to 6th in the round. I would end up tied in points for 10th and lose by .7 of a second. Thankfully, unlike the ROAR Nats, there would be bump ups. Q4 of 4WD I just went for it. The track was getting more grip and the track surface was getting cleaner and cleaner. I went out on Proline Primes (slicks) and just needed to see if the track was ready for them or not. My car was a slot car for 90% of the track, but a complete drift car on the other 10%. I came out leading the heat and running crazy fast laps, faster than anyone had run all weekend. I was driving very smart and letting the slicks do the work. When the track isn’t quite ready, you can still go fast if you brake early and really roll the corners, as you have crazy corner speed with all the extra traction you have. The chicane/double was the tricky section though, if I went an inch too wide and had to hit the brakes, I would get very very loose. I made some mistakes there and really struggled to do that section consistent, and finished 5th for the round. Now it was time for the mains. This race is different, they run 10 direct into the mains, then do a two car bump up system to have a 12 car, single 10 minute main. My setups were awesome, now I just needed to sort out my tires. I don’t think slicks are the answer, but I want to have just about bald tread in the center, and low tread on the sides. I had set for 4WD that was prefect, so I was set for that main. For 2WD I had to run the B-Main and then have a set for the 10 minute A-Main if everything went to plan. I decided to run the same set I ran in Q4 and would hope that they would wear out some more and be perfect for the A-Main. I started first in the B-Main and did exactly what I needed to do. Clean start, get into the flow, and just drive my own race. My car felt good, tires were too high, so my grip wasn’t great, but I drove smart and mistake free, taking as easy win. 4WD A-Main was up and I was excited. My car felt AMAZING in the warm up and I knew it would be a good race. I got a great start and would stay on Cavalieri, pressuring him early. I would make a great pass before the whoop section and take the lead, but he would get it back a few laps later. We battled hard, swapping the lead and never getting more than one second away from each other. With a few minutes to go I was holding the lead and feeling very confident to take the win, but then my rear end stepped out in the corner after the whoops, I landed on the pipe and flipped, but I landed on the wheels. I charged hard to catch back up and got close on the last lap, but couldn’t make a pass, taking 2nd. 2WD I would work on a set of tires after the B-Main. I made my set bald in the center on both fronts and rears. I needed to have tons of grip if I wanted to charge up and podium from 11th. I had a great start and missed all the early crashes, getting into 6th by the third lap. I reeled in Evans and Hartson and felt like both were much slower than I was, so I wanted around them fast as the leaders were not too far ahead. My car was feeling perfect and I was fast. I got passed Hartson, and then went after Evans, but I think I rushed it too much and went into the sweeper after the straight too fast, flipping and dropping back. It was a hard crash and sent me back to around 9th. A few laps later I would have a smaller crash, landing sideways and flipping, but my front caster block broke. Most likely from the big crash a few laps earlier, but in the end, it was a DNF. Another frustrating race in 2WD. The past two races my 2WD has been handling awesome, but the races and results just have not been able to showcase the speed I have had. I would like to thank all my fans, my friends, my family, my sponsors, Kyosho, Orion, MX, Proline, KO Propo, Speed RC, TD Paint, Upgrade-RC, Lunsford, Rock Brook Church, and the Good Lord Jesus Christ. Thanks for reading and I look forward to the next race, God Bless! thanks for keeping your website up-to-date. It’s informative. Would you please post some pictures of your RB 6.6 and ZX 6.6 also with the body off? Yes I can post some body off pictures sometime soon. I have some prototype JTP parts on my ZX6, so I haven’t posted many body off pics. I’m trying to get them made, then I will post body off pics. many thanks for you feed back. I look forward to some body off pictures on your RB6.6 or ZX6. With the occasion I would kindly ask you to provide with some build tips about the RB6.6 if possible. Also advice what a PRO Driver like you doing on the kit. I would be nice to hear about that from you.